Meet Beth a Longfellow resident who makes her point by biking. A social worker by profession on her way to work early this morning she crossed my path on her bike as I was out and about taking photos. When I saw her bike sign I followed her (okay chased her in my car, do not do this it scares people!) to catch up with her hoping for a conversation and possibly a photo. She was more than cordial when she realized that I was not out to get her! 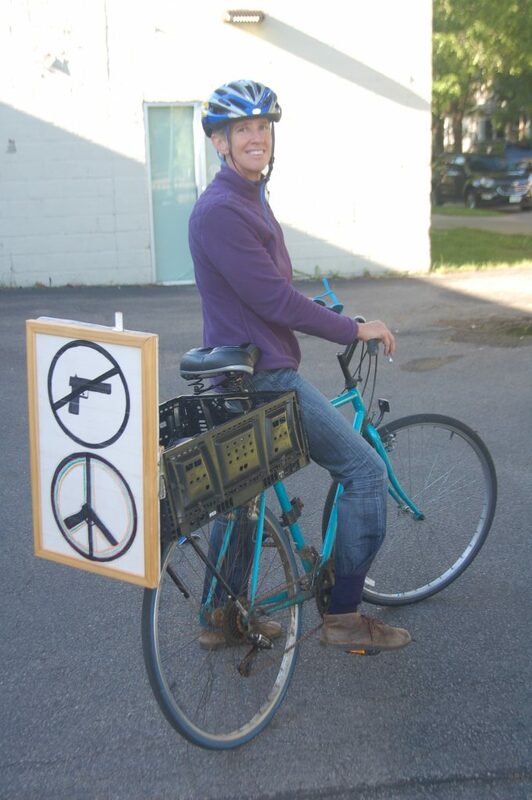 As you can see by her bike sign her soapbox issue is we need more peace and fewer guns. “Guns (hand guns and assault weapons) are designed primarily to kill humans. Let’s think about this. Let’s talk about this. Let’s do something.” We had a great conversation about all sides of the issue and how tricky or should I say delicate it is these days (or really as always I guess) to have such conversations. Thanks Beth, I am with you for more peace with fewer guns!